Exis Technologies, headquartered in Darlington, UK, is the leading supplier of compliance systems for the management of dangerous goods in sea transport. For over 25 years major container shipping lines, ports and shippers have been relying on Hazcheck Systems for regulatory compliance, efficiency and safety in their global operations. They serve 80% of the top container lines. Exis Technologies also develops e-learning courses. IMDG Code e-learning is a cost-effective training solution for shore side staff that has been implemented by half of the top 20 container lines as well as shippers and logistics operations worldwide. 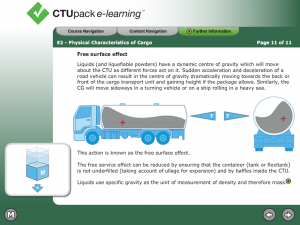 CTUpack e-learning is the latest addition to their training courses. Dachser UK is proud to have been honoured by the British International Freight Association at its annual awards ceremony held in London on 16th January. The award, sponsored by the Albacore Group and presented by TV presenter Julia Bradbury, is for Staff Development. 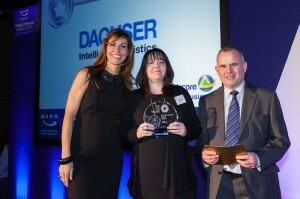 The judges commented that “Dachser showed outstanding commitment to staff development with numerous schemes. These included setting up its own training facility and monitoring progress every step of the way”. Dachser UK is part of the German head-quartered Dachser organisation, a global logistics provider. Dachser views itself as a ‘learning organisation’ and is committed to the on-going development of its staff. This philosophy led the group to invest in the Dachser Academy in 2008. Located in Cologne, the Academy provides a selection of initial and advanced training for employees. It also helps to support and communicate the development programme. HR Manager for Dachser UK, Nicky Holdcroft, who accepted the BIFA award on behalf of the UK organisation, explains how the development programme works in the UK. ‘It ensures that each employee understands the business plan and is able to actively contribute to the achievement of the Company’s business. There is a focus on the conduct expected of employees in a work environment that fosters growth and personal, as well as corporate development,” she noted. Dachser also provides opportunities for suitably qualified employees to take a Bachelor Degree in Logistics at the Berlin School of Economics; a course fully developed and supported by Dachser. The aim of this scheme is to train future leaders, rounded in their knowledge and experience of logistics and fully equipped to support business growth plans in the future. Georgia Sunderland of Dachser in Rochdale is currently midway through the three-year course in Berlin and also attended the BIFA awards ceremony. “I’m really pleased that Dachser has been recognised by BIFA as a company that provides superior training options for the development of its staff. I personally am benefiting tremendously from the opportunity to study in Berlin and to gain excellent practical experience via placements at various facilities throughout the Dachser network,” said Georgia. DACHSER UK is part of the Dachser group, a major international logistics provider. With a staff of 21,650 employees in 37 countries at 347 locations all over the globe, in 2012, Dachser generated revenue of EUR 4.41 billion and handled 49.8 million shipments weighing a total of 37.46 million tons. The officers and crew of Evergreen Line’s 7,024-TEU containership EVER SUMMIT successfully rescued sixteen Indian seafarers in the South China Sea on January 20. At 14:00 that day EVER SUMMIT received a distress call from the BITU GULF, a Panamanian tanker, which was sinking. The containership was on route from Shekou, China to Tanjung Pelepas, Malaysia. The captain of EVER SUMMIT immediately ordered his crew to stand by for a rescue operation and made best speed to the location of the distressed vessel. Upon finding the lifeboat of BITU GULF around forty nautical miles off the coast of Vietnam, the crew of EVER SUMMIT acted promptly and successfully rescued all sixteen seafarers of the tanker at 16:35 pm. 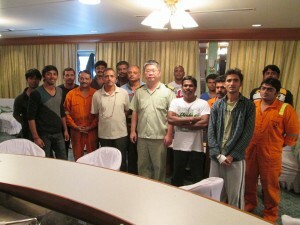 The rescued seafarers received care on board EVER SUMMIT as the ship continued its voyage to Tanjung Pelepas. On completion of the rescue operation, Evergreen notified Lilly Maritime Pvt. Ltd, the owner of BITU GULF, to take responsibility for their crew in Tanjung Pelepas and arrange their repatriation. EVER SUMMIT is one of Evergreen Line’s「S」type vessels with a capacity of 7,024 TEUs. The ship is currently deployed in the carrier’s Far East-Middle East Gulf (APG) service. On November 28, 2011 the crew of Evergreen Line’s 1,164-TEU UNI- ASPIRE performed a life-saving mission south of Hong Kong and rescued a Korean seaman. 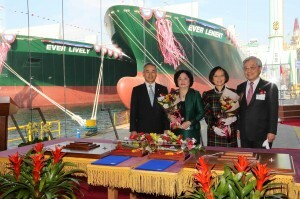 EVER LIVELY, the sixteenth in a series of Evergreen Line’s L-type containerships built by Samsung Heavy Industries, was christened by Bronson Hsieh, the Evergreen Group’s Second Vice Group Chairman, at the shipbuilder’s shipyard in Korea today. The official rope-cutting of the new 8,452-TEU vessel was performed by Ms. Ching-fen Cheng, Executive Vice President of Central Reinsurance Corporation. On the same day, Vice Group Chairman Marcel Chang presided at the naming ceremony of EVER LENIENT, the seventeenth vessel in the series. The rope-cutting on this occasion was conducted by Mrs. Connie Chang, wife of Mr. Chang. “As a primary benefit of our ongoing fleet renewal program, we have seen a significant enhancing of the fuel efficiency of the line’s operation. We believe that the delivery of EVER LIVELY, EVER LENIENT and other newbuildings to come will continue to improve the competitiveness of our operating fleet in the global shipping market.” said Mr. Hsieh in his speech at the ceremony. EVER LIVELY and EVER LENIENT are owned by Evergreen Marine (Singapore) Pte Ltd and Evergreen Marine (UK) Ltd respectively. The two ships are 334.8 meters in length, 45.8 meters wide, has 948 reefer plugs and a draft of 14.2 meters. Each can cruise at speeds up to 24.5 knots. Both will be delivered in February and join Evergreen Line’s Far East – Middle East route. Evergreen Line commenced its fleet renewal program in 2010 when shipbuilding costs reached cost-effective levels. The project entailed ordering of thirty L-type vessels and chartering of five 8,800 teu ships as well as ten 13,800 teu units. The carrier also recently signed agreements to charter ten 14,000 teu vessels. The newbuildings will act as replacements for existing units; the delivery of newbuildings will be balanced by redelivery of currently chartered ships when their charter periods expire. TT Club, the insurance specialist serving the global freight industry, continues to support innovation in the logistics sector. TT Club, which provides liability, cargo and propertycover to freight forwarders and logistics companies, once more observes that innovation in technological capabilities and tailored supply chain processes is essential for logistics companies to thrive in a sustained competitive environment. A long-term supporter of the British International Freight Association (BIFA) Awards, TT Club sponsored the 2013 European Logistics Award. TT Club’s Development Director for UK and Ireland, Brian Sullivan, was part of the judging panel that employed a stringent vetting process to find the most deserving entry. This year the winner is DSV. The award was presented by Sullivan to DSV’s Chris Malyon at a ceremony in London on Thursday, 16 January. The Club’s detailed knowledge of its own Members’ supply chain services has convinced Sullivan that the proliferation of innovation in the sector and a trend away from rate-driven commoditisation is a very real phenomenon. “Many in the freight transport industry feel that pressure on rates from customers has shorn the operator of the necessary resource to deliver the added-value elements that distinguishes logistics from the straightforward ‘A to B’ transportation of freight. As a result of my own and the Club’s experience, I would contest this view,” comments Sullivan. TT Club is certainly seeing more extensive services being provided by its customers. Many companies that in the past offered traditional freight forwarding now take on a much higher degree of supply chain risk and sustain greater liability by providing increasingly complex and sophisticated services. The trend is however seen as positive. The increased complexity of service offerings and the ingenuity of operators in designing alternative supply chain solutions provides opportunity for new entrants as much as established logistics companies. TT Club recognises the need to support and reward quality innovation in the industry and has been a sponsor of the BIFA awards since their inception nearly twenty years ago. By the very nature of the insurance services it provides, the Club is at the heart of the supply chain industry and consequently, is able to monitor the dynamic trends that are always at play as logistics operators strive to improve their service offerings to meet market demands. Kempten/Lyss (CH), January 16, 2014. 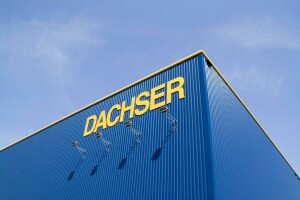 Logistics provider Dachser is expanding its presence in Switzerland with the opening of its new site in the Bern region. The international company is enhancing its global operations by establishing its ninth Swiss site that will occupy an area of 12,200 square meters, and create around 40 new jobs in the region. The groundbreaking ceremony took place at the construction site in the Lyss industrial park, with Marcel Meier, President of the Board of Directors for Dachser Switzerland, in attendance, along with Urs Häner, Country Manager and Andreas Hegg, Mayor of Lyss. Start-up of operations at the new site is anticipated for September 2014. From 2015 on, Dachser will have a presence in the Canton of Bern in addition to its already existing locations in the Cantons of Zurich, Basel-Land, St. Gallen, and Waadt. “The new site will enable us to develop our operations in the Bern region and, at the same time, to relieve the pressure on Birsfelden,” explains Urs Häner, Country Manager of Dachser Switzerland. Additionally, the proximity to Western Switzerland will shorten the runtimes as much as an entire day. Lyss is another important hub for a network that enjoys seamless Europe-wide coverage. “With its nine branch offices, Dachser now has a presence in Switzerland’s most important economic centers,” says Urs Häner. The first phase of construction entails a 2,260-square-meter warehouse for industrial goods, where 18 trucks can be loaded and unloaded. Each floor of the two-story office building is 680 square meters. In addition, a 4,000-square-meter area has been reserved for a possible building expansion. This second construction phase is planned for 2019. Dachser Spedition AG (Dachser Switzerland) is a subsidiary of Dachser, a transport and logistics provider headquartered in Kempten, Germany. The first branch office in Switzerland was opened in 1967. Today, Dachser Switzerland has a presence in eight locations and 239 employees; in 2012, it generated gross revenue of CHF 163.98 million. In the past year, Dachser Switzerland transported 506,600 shipments weighing a total of 332,900 tons. Dachser, a family-owned company established in 1930 and headquartered in Kempten, Germany, is one of the leading logistics providers in Europe. Dachser’s portfolio comprises transport logistics, warehousing, and customer-specific services in three business areas: Dachser European Logistics, Dachser Food Logistics, and Dachser Air & Sea Logistics. Comprehensive and multi-disciplinary services, such as contract logistics, consulting and advisory services, and industry-specific solutions round out the company’s offerings. A seamless transport network—both in Europe and overseas—and information technology that is fully integrated into all its systems provide intelligent logistics solutions worldwide. The third low-emission, fuel-efficient L-type vessel to be built by the CSBC Corporation in Taiwan for Evergreen Line was named at a ceremony, held at CSBC’s Kaohsiung shipyard today. The ceremony was officiated by Mr. S. S. Lin, First Vice Group Chairman of Evergreen Group. The official rope-cutting of the new 8,508 teu EVER LUCID was performed by Mrs. Woo Mun Tak, wife of Mr. K. L. Chen, Director of Evergreen Marine (Hong Kong) Ltd.
With a deadweight of 105,000 tonnes, EVER LUCID is currently the biggest Taiwan-flagged vessel. This ship is 334.8 meters in length, 45.8 meters wide, has 948 reefer plugs and a draft of 14.2 meters. The vessel can cruise at a speed up to 24.5 knots and is owned by Evergreen Marine Corp. EVER LUCID will join Evergreen Line’s Far East – Europe route after her delivery on January 15. 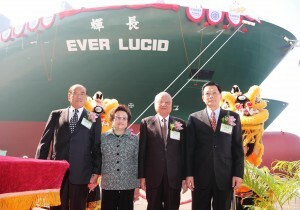 EVER LUCID is the latest vessel in Evergreen’s fleet renewal program. This commenced in 2010 at a time when shipbuilding costs were at cost-effective levels. The project entails thirty L-type vessels, which will act as replacements for existing units; this is achieved by balancing the newbuildings with the redelivery of currently chartered ships when their charter periods expire. Again as part of its fleet rejuvenation and to meet the requirements of its service cooperation agreements with various strategic partners, the line has signed charter agreements for five 8,800 teu vessels already delivered in 2013 as well as ten 13,800 teu to be delivered by the third quarter of this year. Evergreen Line is continuing its fleet renewal program and has signed charter agreements with both Costamare and Shoei Kisen Kaisha to each provide, on charter, five 14,000 teu containerships to be delivered during 2016 and 2017 respectively. The ten new vessels, which include the seven announced last month, will further optimize the competitiveness of Evergreen’s operating fleet and reduce the carrier’s unit costs. As this is a fleet renewal program, the newbuildings will be replacements for existing vessels and balanced by the redelivery of currently chartered ships when charter periods expire. Evergreen’s operating tonnage therefore will not be increased. The ten ships will be fully equipped with fuel saving technology. Their fuel consumption will be substantially lower than ships of the same size built prior to 2010. These ships will not only enhance the line’s operating performance but will also meet the stringent requirements for environmental protection that the carrier has set itself. Menlo Worldwide Logistics is implementing a radical new product picking regime involving ‘Pick to Light Carts’ developed by warehouse system integration specialist Inther Logistics Engineering. The system has been operational at the global logistics company’s Maastricht (Netherlands) facility since early December and is to be rolled out across its international network in the coming months. Menlo and Inther have been working on the new system’s development for 3 months and have now completed successful trials with the ‘Go Live’ implemented for a medical device client in early December. Menlo’s Maastricht facility in the Netherlands is the first operation to bring the system into operation, and will assist Menlo in processing some 60,000 orders per year for this particular client. Initial measurements of the system’s performance show overall improvement in productivity of up to 20%. 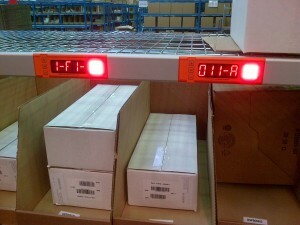 With guidance lights on the reception bins of picking carts, which move from aisle to aisle, rather than on the storage racking, product location display and confirmation buttons are also positioned on the carts. This configuration allows operators to locate and secure product more quickly than more traditional picking methods. Although existing carts can be adapted to utilise the new equipment, Menlo have chosen to invest in new carts, which can also accommodate 16% more orders and have a facility to carry larger, or irregular out-sized items. Inther is an international system integrator. We are a ‘one-stop shop’ for all logistic issues. That means you have a single point of contact for all matters concerning the project. Inther listens, designs, delivers, integrates and bears 100 percent final responsibility for its projects. In November last year, the powerful typhoon Haiyan devastated the central region of the Philippines, causing catastrophic damage. The victims are still in urgent need of life’s daily necessities. Evergreen Line has worked with international aid agencies to arrange free transportation services to carry relief supplies to the affected areas. These relief supplies, including drinking water, dry food, tents, medical and sanitarian items, were collected by Crisis Relief Services & Training (CREST), a non-profit Christian humanitarian organization in Malaysia. Four twenty-foot containers of relief supplies were carried by Evergreen’s ITAL ONORE from Port Klang to Kaohsiung on December 31. The supplies then connected to the UNI-ASPIRE for delivery to Cebu in the Philippines on January 03. CREST is planning to deliver another three twenty-foot containers of humanitarian supplies with Evergreen Line’s help for transportation from Port Klang in early February. Following the natural disaster two months ago, the Philippines has been receiving continuous supplies of humanitarian aid from around the world. For its part, in addition to providing free transportation services, Evergreen has also provided seventeen forty-foot containers to International Container Terminal Services, Inc. (ICTSI), a terminal operator in Manila, for delivery of relief supplies. Evergreen is pleased to be able to take concrete action to bring relief supplies to the disaster areas and to fulfill its corporate social responsibility as a global ocean carrier.